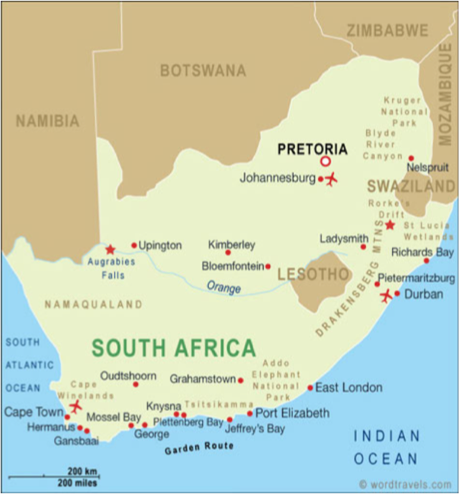 South Africa, officially the Republic of South Africa (RSA), is the southernmost country in Africa. It is bounded on the south by 2,798 kilometres (1,739 mi) of coastline of Southern Africa stretching along the South Atlantic and Indian Oceans; on the north by the neighbouring countries of Namibia, Botswana, and Zimbabwe; and on the east and northeast by Mozambique and Swaziland; and surrounds the kingdom of Lesotho. South Africa is the largest country in Southern Africa and the 25th-largest country in the world by land area and, with close to 56 million people, is the world's 24th-most populous nation. South Africa is a multi-ethnic society encompassing a wide variety of cultures, languages, and religions. The population consists of Africans (black), Europeans (white), Asians (Indian), and multiracial (coloured) people. Its pluralistic makeup is reflected in the constitution's recognition of 11 official languages, which is among the highest number of any country in the world. Two of these languages are of European origin: Afrikaans developed from Dutch and serves as the first language of most white and coloured South Africans; English reflects the legacy of British colonialism, and is commonly used in public and commercial life, though it is fourth-ranked as a spoken first language. The country is one of the few in Africa never to have had a coup d'état, and regular elections have been held for almost a century. However, the vast majority of black South Africans were not enfranchised until 1994. During the 20th century, the black majority sought to recover its rights from the dominant white minority, with this struggle playing a large role in the country's recent history and politics. The National Party imposed apartheid in 1948, institutionalising previous racial segregation. After a long and sometimes violent struggle by the African National Congress and other anti-apartheid activists both inside and outside the country, the repeal of discriminatory laws began in 1990. Since 1994, all ethnic and linguistic groups have held political representation in the country's democracy, which comprises a parliamentary republic and nine provinces. South Africa is often referred to as the "rainbow nation" to describe the country's multicultural diversity, especially in the wake of apartheid. The World Bank classifies South Africa as an upper-middle-income economy. Its economy is the second-largest in Africa, and the 34th-largest in the world. However, poverty and inequality remain widespread, with about a quarter of the population unemployed and living on less than US$1.25 a day. Nevertheless, South Africa has been identified as a middle power in international affairs, and maintains significant regional influence. South Africa contains some of the oldest archaeological and human-fossil sites in the world. Archaeologists have recovered extensive fossil remains from a series of caves in Gauteng Province. The area, a UNESCO World Heritage site, has been termed the "Cradle of Humankind". Raymond Dart identified the first hominin fossil discovered in Africa, the Taung Child (found near Taung) in 1924.